Just when you think Japanese TV has settled down, it goes and pulls a stunt like this. Television program Itte Q! sent some members of its celebrity panel to Taiwan, where they got to experience a car seesaw, among other activities. 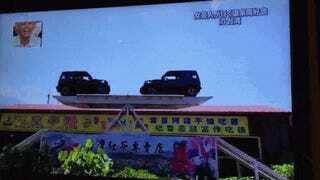 The driver, a fellow named Mr. Wan, has been doing this car seesaw stunt for the past twenty-seven years. He’s a car seesaw pro! There are people in both vehicles! Mr. Wan drove both up on the seesaw, perfectly balancing them by going from car to car.